A couple days back I blogged about my hand-crafted clothespin business (and showed lots of pictures of the finished product). I told about how I was working to get the first production run of pins ready to sell, and I let it be known that the price would be $1.50 each for ten finished clothespins. Someone commented and asked if they might get some unfinished clothespin halves, with springs, for less money. The more I thought about that idea, the more I realized it was an excellent concept. It's kind of a variation on the old Frostline sewing kits I wrote about recently (HERE). The clothespin kit will contain 19 of the high-quality stainless steel springs, 38 unfinished hardwood (ash) clothespin halves (enough to assemble 19 clothespins), and one sanded, oiled and assembled clothespin. That makes a total of 20 clothespins in the kit. The unfinished wood will be tumbled and mostly smooth, but there will be some touch-up needed. You can do the touch-up with an emery board. Click picture to see an enlarged view. After the wood is sanded to your satisfaction, you can assemble the unfinished clothespins and put them right to use. Or, you can give them a protective coating of boiled linseed oil. If you coat them with linseed oil (recommended) you will need to let them air-dry for a week or so (until thoroughly dry) before you assemble and use them. If you want to wax them after the linseed oil is dry, you can do that too. 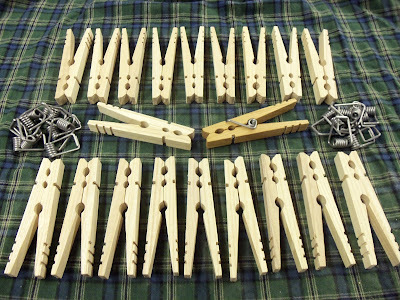 This new make-your-own clothespin concept allows me to get the clothespins on the market so much faster. And it allows me to be able to sell the clothespins for less. 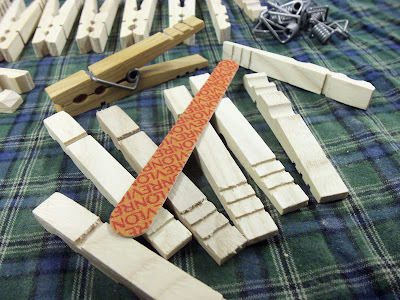 The price for a make-your-own clothespin kit, as shown and described above, will be $20 (plus $5 for shipping). I still intend to offer completely finished clothespins, but don't see this happening before the end of this year, and the price will need to be more than the $1.50 I had thought I would sell them for. The labor to finish-sand, oil and assemble the pins is turning out to be much more than I expected. 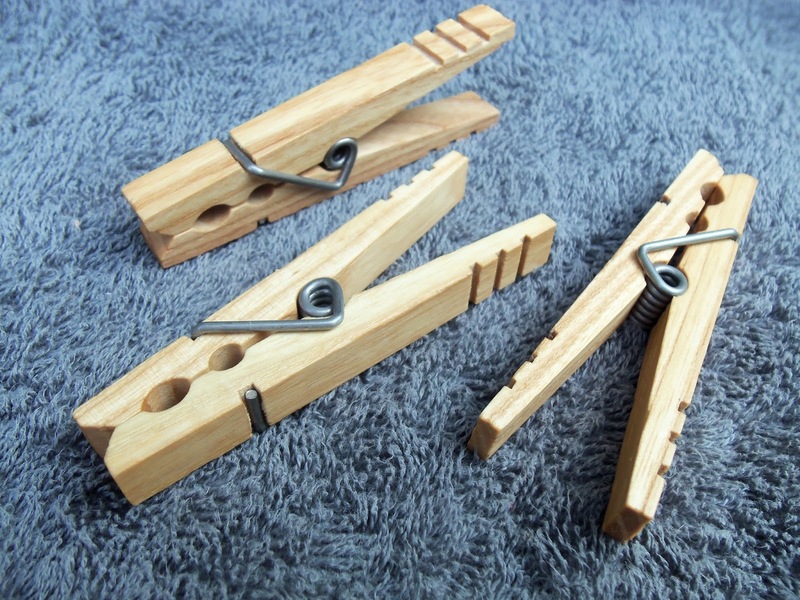 I have a feeling that most people who use clothespins, and who will truly appreciate the quality of these clothespins, are the kind of people who are fully capable of using a little sandpaper and linseed oil. It won't take that much time or effort, and when you're done you'll have some really special clothespins. Your own homemade clothespins, with their powerful stainless steel springs, will hold jeans on the line.... no problem. I would be interested in several "bundles", so my question is, when purchasing in quantity, would there possibly be a better rate on the mailing cost? Also, is there anything special to know about applying the linseed oil? I operate a Made in America store and would like to carry your clothespins. To start, I will be charging a flat rate of $5 per order for shipping, regardless of the number of kits ordered. There is nothing special about applying linseed oil. Just rub it on, and let it dry. I hope to have an online tutorial about finishing. I'll send you an e-mail. But I'm sure that I can not supply either clothespins or kits at a wholesale price. As it is, I'm barely covering my material and labor costs. My mfg. process needs to be simplified and tweaked to get costs down. Even still, I can't imagine ever getting the price down enough to sell wholesale, and have the clothespins be affordable to people. I would like to place a banner on my sidebar advertising them. Do you have an HTML banner with a link made up? Thanks. I think this is a great idea! I really want to get your clothespins. As it stands though, I'm not using my clothesline much right now. Although I believe there's a market for a handsome well-crafted clothespin in the crafting world too. I've used my cheap clothespins for a number of simple country decorating ideas from photo displays to baby shower decor. So I just may end up getting some anyways. An idea might be to add the option of adding a small bottle of the linseed oil to your kit. I honestly don't even know where to get boiled linseed oil and, since I don't use it regularly around here, I would pay a higher price per oz to get a small bottle that contains just enough for the project at hand. Thanks for your response -- I obviously misunderstood you -- I thought you meant $5 for EACH kit, and since I wanted several, $40 in shipping made me stop and take a deep breath! Thanks for setting me straight. These will make great gifts. I wish you the best in this venture! That's very gracious of you. I'll have to figure out how to make a banner. Does anyone out there know of a simple banner-making web site? There are other options for coating the wood and I'll discuss them at the web site I put together. Sending some linseed oil through the mail gets complicated because it is flammable. They are not hard to put together. I'll show how in the photo-tutorial at the web site. You misunderstood because I wasn't clear. I don't think I really even thought about someone buying more than one kit at a time. But, you are right, they would make great gifts. What a good suggestion by a reader and a great decision on your part to follow. I wouldn't be so quick to limit your pricing models. IMHO, at $1.50 your clothespins won't be perceived as expensive by many in the highly affluent "green" crowd. Possibly visit one of the "green/sustainable" online shopping sites for suggested pricing.? I like to tell my wife that "Every now and then I come up with a good idea"... I guess this was one of them. Glad to see it's so well received! I'll have to see what I can do on ordering some. Here's another question, could I save some $ by buying a book, some clothes pins, some of your instructions, etc. as a bundle... a Wizbang bundle? 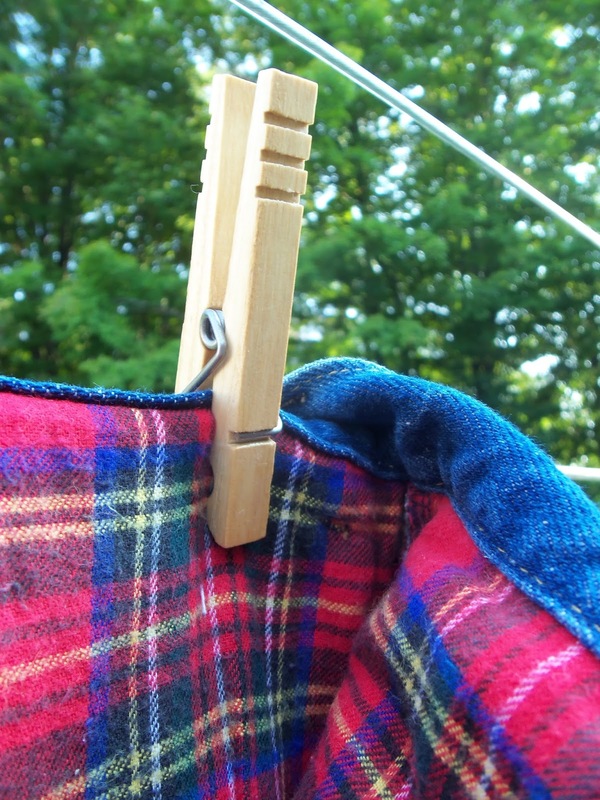 A thing about the clothes pins going askew, what if you hooked the tip of the spring so that it went down into the wood a tiny bit, just a thought.